My occasional penchant for hyperbole notwithstanding, I really think that this could be the most ridiculous and ridiculously unfair attack I’ve seen from Capitol Fax‘s Rich Miller in quite a while. If you don’t get the cartoon, it’s a reference to the character(s) Master Blaster from the movie Mad Max: Beyond Thunderdome. Master, the little guy up top is the brains, and Blaster is the braun. It’s clever, and a great film reference. 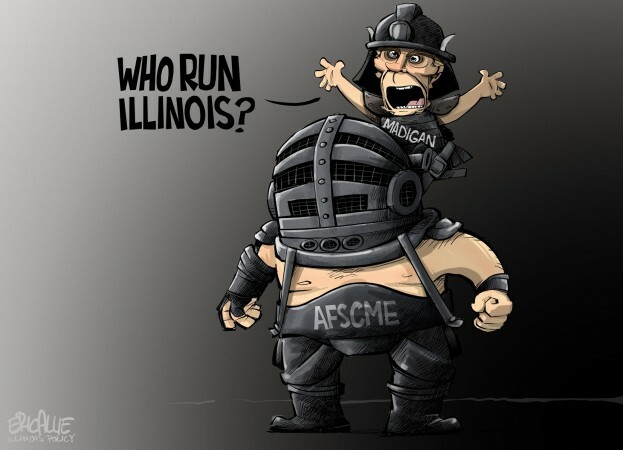 Miller’s assertion in his curt one line of commentary is that if Rauner is willing posing next to this less-than-flattering depiction of Mike Madigan and AFSCME, then he can’t possibly be serious about negotiating a “fair” contract with the union. I don’t think that argument holds on its own merits, but set that aside. Is Rauner even posing with the cartoon characters in the photo? No, he’s quite clearly not. It’s pretty clear that Rauner is only posing with the gentleman in the suit, and not the cut out on the Illinois Policy Institute table in the convention hall. The picture taken by Chooljian and posted by Miller to take a potshot at Rauner is, quite obviously, being taken from a different angle than the one that Rauner is actually posing for. But, to Rich Miller, Rauner coincidently standing too close to the AFSCME cartoon cutout in a picture he doesn’t know is being taken of him (the one by Chooljian, not the one he’s clearly posing for that we’ve established doesn’t contain the offending cartoon) amounts to the Governor’s endorsement of the sentiment expressed in the cartoon. Miller likes to position himself as a fair, non-partisan arbiter of all things Springfield politics. But this one short post belies that facade and shows that he has very, very little interest in treating Bruce Rauner fairly, or even giving him the occasional benefit of the doubt.